Bosch Universal Mini-whip fits on the Slicer/Shredder Attachment and allows you to mix or whip smaller quantities. It drops on the middle spindle and will spin on it axis as well as go around the bowl to give double whipping action. 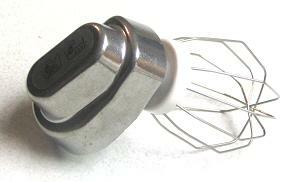 It is great for whipping cream, cake mixes, egg white etc. It it not designed to do heavy mixes like muffins or cookies. Especially good if you require a second bowl for whipping egg whites, when making sponge cakes and waffles.